With so many things to do around here and so many thoughts in my head worrying about the Pres, I honestly don't know how long it's been since I posted. However, after the "fungus among us" (don't worry you'll read about it soon) subsided enough for me to go public, I did just that. My first stop was to finally get my hair cut. My second was to get a pedi, both of which I hadn't done in a long, long time. Asking Meg to put in layers and shorten my "do" was definitely the right choice, although I did insist that she not touch my neck and/or jawline just in case I was still contagious! Covering my neck with a towel while she snipped, shaped and shortened, I knew it was something I needed. So, after putting up my feet and getting some lots of rest, I am rebounding physically and mentally...thank goodness! Did I tell you that our washing machine died? Talk about lousy timing. One day it worked, the next day, the door on the 12 year old frontloader just wouldn't work. i had been wondering about you. i believe it's been 2 weeks since you had posted. glad you're doing better! I've missed you. So glad to see your post today. I'm also glad to hear you got a little pampering. Glad you're feeling better, and pampering yourself too!! Well I have been so far behind blogging. Life has a way of changing so quickly, that blogging sometimes has to take a back seat. My mil had a massive stroke and passed. May was rough. It's gotta get better huh? 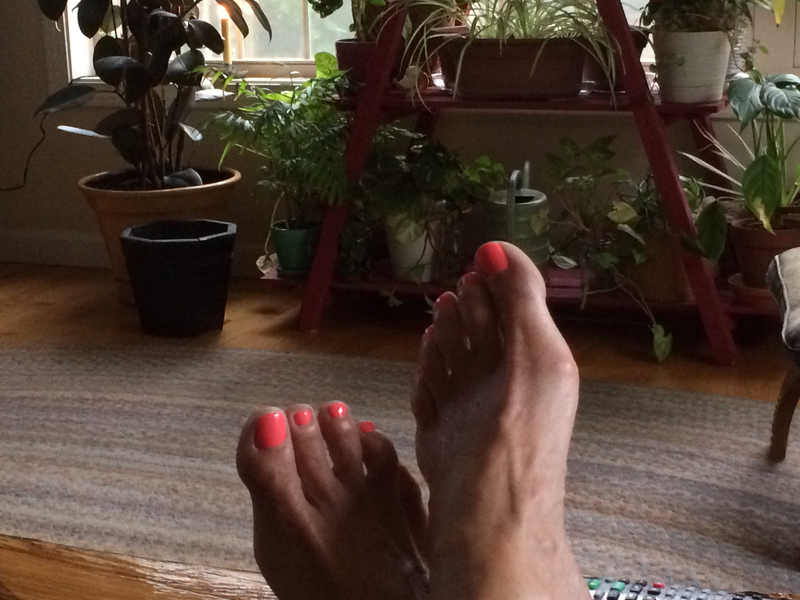 And, I haven't had a pedi in about 15 years because the only one I ever got I ended up with toenail fungus. It took years to get over it. Tea tree oil applied twice a day for about a year is what finally got rid of it. I'd like to hear more about your fungus. Only because my sister has been having a problem with dry scaly looking patches on her face and the Dr can't figure it out. Fungus medicine cleared it up last time, but it just came back. your toes look wonderful and sorry you had whatever you had, i missed you but thought you were busy. Sometimes it just seems like stuff happens faster than we can deal with it. arghh. The toes look great. I recently stopped long enough to paint mine and it was indeed a nice pick me up! Hope things will settle down for you and stay that way for a bit.